No Time to Tag Your Items for The Upcoming JBF Huge Kids' Sale of Longmont on May 9-12 @ Boulder County Fairgrounds. CLEAN OUT AND CASH IN! Let Our Expert VIP Taggers Do The Work For You! REGISTRATION CLOSES ON April 22nd. RESERVE YOUR SPOT NOW! The cost of VIP Tagging is $.45/tag. The total is due and must be paid directly to the VIP Tagger. A $.10/tag supply charge will be deducted from your consignor check. This covers the cost of hangers, safety pins, card stock, ink, zipties etc. The consignor fee is $15 if items are picked up after the event or $10 if items are donated. The supply and consignor fee will be taken out of your consignor check. VIP Tagging Consignors make 60% of their gross sales. Helper Shifts are available to receive a higher sales percentage. You may sign up under your profile @ www.myjbftags.com. VIP Tagging Consignors are eligible for a Presale Pass (330-9:00p on May 8th). Prior to dropping my items off to the VIP Tagger, clothing should be sorted by gender and size. All toys must be clean, in working condition, check for recalls (http://www.cpsc.gov/). All battery-operated toys must have batteries. The VIP Tagger has the right to refuse any items that do not meet JBF standards. All "No Thank-You" items received (stained, worn, damaged, outdated, dirty or incomplete etc) will be charged $.25/item. Once items are entered, you will be notified by the VIP Tagger and you will have 24 hours to edit/approve all barcode price tags before the VIP Tagger prints and attaches the tags to your items. *After 24 hours no changes may be made to tags. Once you have been notified that your items are compete, the VIP Tagger will arrange a time for payment/pick-up. Items that are not picked up and paid for within 48 hours after the VIP Tagger contacts you will become the property of JBF. 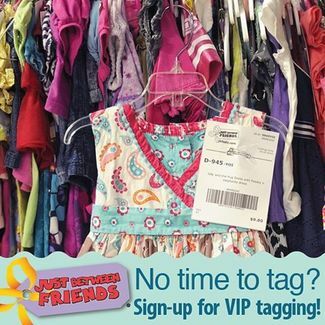 As a VIP Tagging Consignor, you are responsible for taking your items to the sale and placing them on the sales floor during designed drop off times and picking up your items, if you are not donating, after the sale. *Consignor checks will be e-mailed upon pick up. If you choose to donate your items, your check will be emailed after pick-up. *Items left after the designated pick up time will be donated to our Charity Partner. *Just Between Friends is not responsible for fire, loss, theft or damage to my sale items. Questions? Contact Michelle @ [email protected] or Text 720-273-0399.